Rather than teaching chefs how to chop seafood or serving as a convenient reference for marine biologists, fishbone diagrams are actually used as a simple problem solving tool. 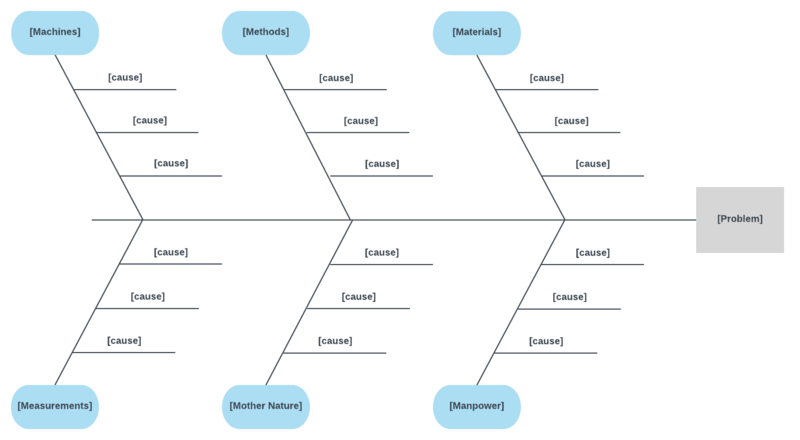 Fishbone diagrams, named for their shape rather than their content, help teams and individuals brainstorm and identify the root causes of a problem. They are useful visuals to include with industry reports, so many frustrated employees ask how to create a fishbone diagram in Word. Although Microsoft Word is known as one of the premier apps for creating reports and other text-heavy documents, it does not boast the same capability for creating and managing visual content. Read on to learn more about fishbone diagrams as well as the best way to put a fishbone diagram in Word. Already a fishbone diagram pro? 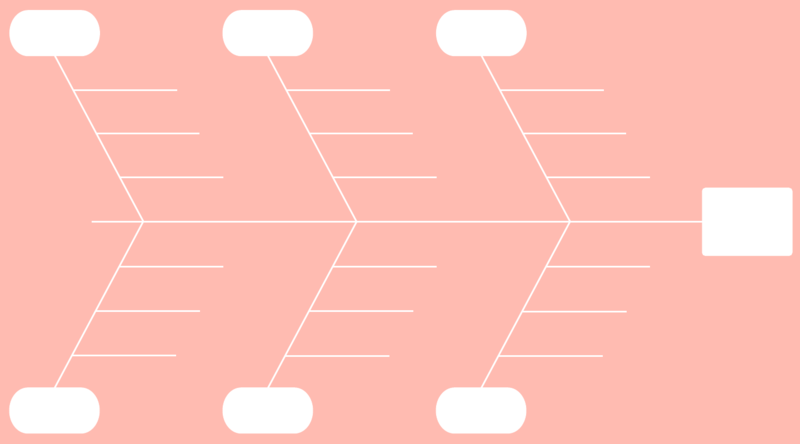 Try our fishbone diagram template for Word. In the 1960s, Kaoru Ishikawa started using fishbone diagrams to conduct quality management at Kawasaki shipyards. 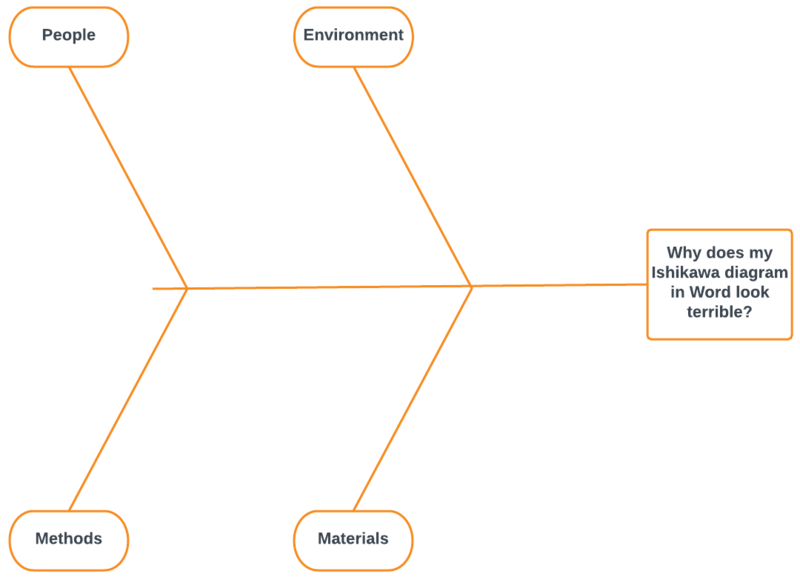 Ishikawa is considered the creator of fishbone diagrams, which explains their second name, Ishikawa diagrams. Other names include herringbone diagrams, cause-and-effect diagrams, characteristic diagrams, and our favorite, Fishikawa diagrams. Although fishbone diagrams can be used in any industry, they are traditionally associated with product design and quality defect prevention. Let’s face it. Microsoft Word was not intended for making diagrams. You can try it if you like, but you’ll feel happier, save time, and be more satisfied with your work if you build your diagram with Lucidchart and then insert it into your Word document using our simple, free integration. So to start, sign up for a free account with Lucidchart. In Lucidchart, creating a fishbone diagram is simple. Just drag and drop shapes and lines onto the canvas. You’ll notice that they snap together so that formatting will take you less time and cause fewer headaches. To build the fishbone structure, place a box and write an observed effect at the front of the diagram where the fish’s head would go. This should be written as a question, such as “Why does your Ishikawa diagram in Word look terrible?” Draw a line extending away from the question, like the spine of a fish. Next, draw lines radiating outward from the spine. Label these with categories that will be used for grouping potential causes. Although you can customize categories as needed, there are a number of standard categorizations used in various industries. The 5 Ms (used in manufacturing): Machine, Method, Material, Manpower, Measurement. A 6th M, Mother Nature, is added in Six Sigma methodology. Now, by yourself or with a team, brainstorm causes that fall under each category. You can dive deeper and deeper into root causes by continuing to ask the question “Why?” Take a look at the example below. Under each of the four categories, we have listed a number of related causes. For some of those causes, we have probed further to really get at the heart of the matter. 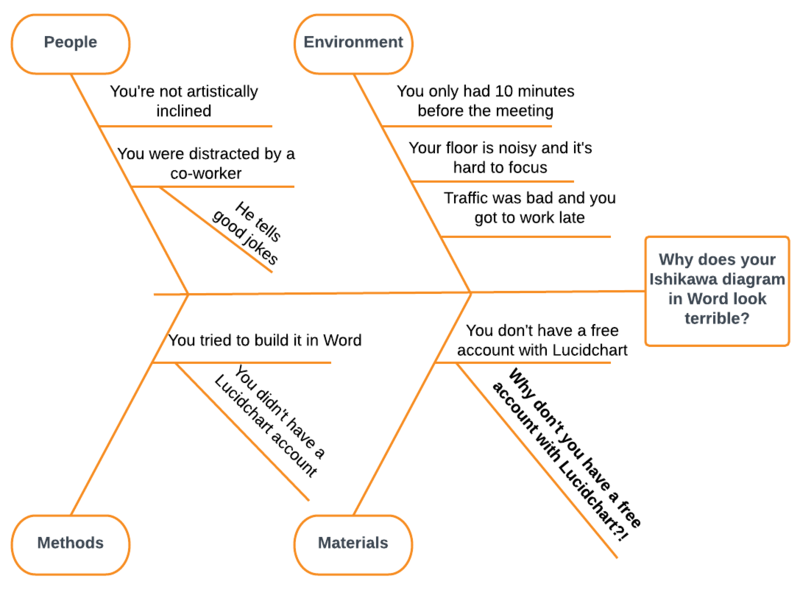 With this fishbone diagram, it’s easy to see that your Ishikawa diagram looks terrible because you didn’t build it in Lucidchart (yes, this is a shameless plug to try Lucidchart). With Lucidchart, even if you’re late to work, your floor is full of jokesters, and your meeting is in ten minutes, you can whip out a professional, polished diagram that will wow your boss and keep your audience engaged. Can we get a chorus of “That was easy!”? To wrap things up, follow these steps to transfer your document from Lucidchart to Microsoft Word. First, install the Lucidchart add-in for Microsoft by clicking the button below and following the directions. Lucidchart also provides free integrations with Google Docs, Sheets, and Slides so you can add diagrams to your web-based documents. Learn more about the integration. We hope you’ve enjoyed learning how to make a fishbone diagram in Word. As you’re getting started, we’ll make it even easier for you. 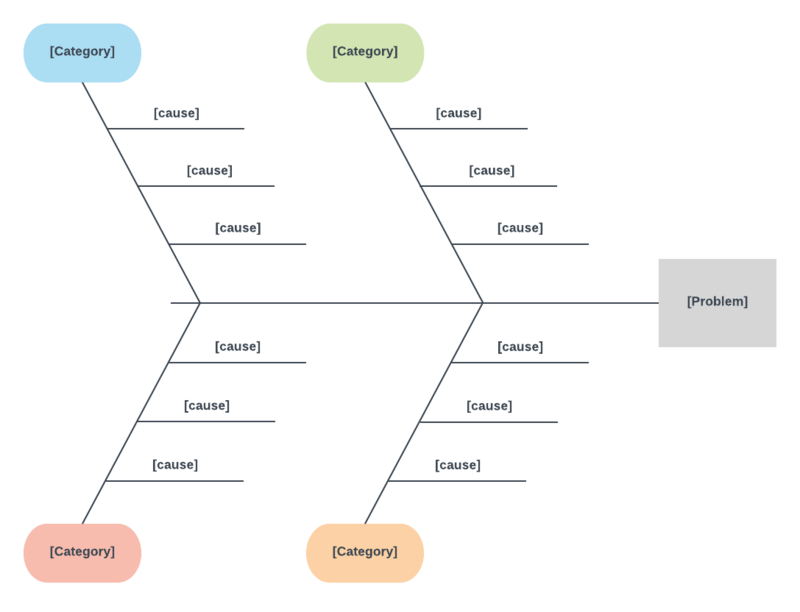 Instead of making your own fishbone diagram from scratch, try using one of our templates.